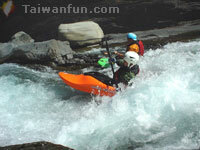 When you couple Taiwan's fairly recent lust for adventure sports with its amazing natural landscape, it's hardly surprising that kayaking is becoming increasingly popular. With more organizations now offering courses or trips that last from an hour up to several days at a range of levels, there couldn't be a better way to enjoy Taiwan's late summer and autumn weather. 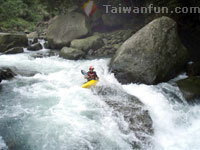 Whether you're looking for a strenuous but relaxing short trip or a thrilling joyride, here's where you can find out just what kayaking in Taiwan is all about. 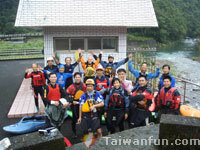 Conveniently, when living in Taipei, you're lucky enough to have several great river kayaking runs within an hour or two of driving. Great for beginners and flat water practice is Pinglin, where adventure camp Cloud9 offers expert instruction, equipment rental and accommodation to fully enjoy the area as well as the sport. For those who catch the kayaking bug, Club 222 is a group of friends who love paddling together and base themselves at the camp. 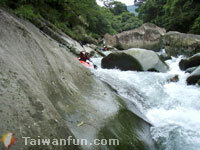 However, they paddle all around Taiwan, predominantly Pinglin, Wulai (class 3+ all year), and Sanxia (class 2-3) rivers. Some skill is required to join them, although a love for kayaking is paramount. As almost all of the members have their own equipment, a certain level of commitment is also required. See below for other organizations offering courses on river and white water kayaking. 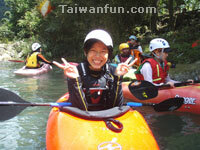 For a different experience, why not try sea kayaking? With ideal sites located on the north and north-east coasts, around Kenting, and the outlying islands, sea kayakers enjoy an unrivaled view of the island's stunning coastline. 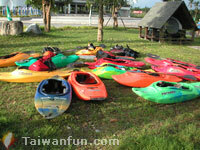 For specialized sea kayak tours in Penghu that are sure to double your enjoyment of any visit to the islands, see the website below. As long as you find the right training, check the safety of any courses you undertake and follow the basic rules, kayaking can provide a relatively safe but ultimately exhilarating experience as you ride the rapids or waves.